John B. King, Jr. is the secretary of education, a position he assumed upon Senate confirmation on March 14, 2016. In tapping him to lead the U.S. Department of Education, President Obama called Dr. King "an exceptionally talented educator," citing his commitment to "preparing every child for success" and his lifelong dedication to education as a teacher, principal, and leader of schools and school systems. As secretary, Dr. King brings a continued commitment to advancing excellence and equity for every student, supporting educators and elevating the teaching profession, and improving college affordability and completion rates. Before becoming secretary, Dr. King served since January 2015 at the Department as principal senior advisor. In that role, he carried out the duties of the deputy secretary, overseeing all preschool-through-12th-grade education policies, programs, and strategic initiatives, as well as the operations of the Department. Dr. King carried out this work with a focus on increasing equity, improving educational outcomes for all students, and closing achievement gaps through implementation of key administration priorities in areas including early learning, elementary and secondary education, special education, English language acquisition, and innovation. In performing the duties of the deputy secretary, Dr. King also oversaw the Department's work leading cross-agency collaboration for President Obama's My Brother's Keeper task force, which seeks to address persistent opportunity gaps faced by boys and young men of color, and to ensure that all young people are able to reach their full potential. Prior to his arrival at the Department, Dr. King served since 2011 as the commissioner of education for the state of New York. In that role, he served as chief executive officer of the State Education Department and as president of the University of the State of New York, overseeing the state's elementary and secondary schools (serving 3.1 million students), public, independent and proprietary colleges and universities, libraries, museums, and numerous other educational institutions. Dr. King was one of the nation's youngest state education leaders at the time of his appointment and the first African-American and Puerto Rican to serve as New York State education commissioner. As commissioner of education, Dr. King worked with the Board of Regents to pursue an ambitious education improvement agenda. During his tenure, New York State was a national leader in many facets of education: investing in high-quality early learning; raising standards for teaching and learning; supporting teachers and school leaders through strong professional development, access to rich instructional resources, and innovative educator career ladder models; expanding career and technical education in high-demand fields; and increasing educational opportunity for students in the highest-need communities. Under Dr. King's leadership, New York deepened collaboration between the state's preschool-through-12th-grade (P-12) schools and its institutions of higher education, including strengthening teacher and principal preparation, and raising the bar for teacher and principal certification. Dr. King brings to his role extensive experience leading urban public schools that are closing the achievement gap and preparing students to enter, succeed in, and graduate from college. Prior to his appointment as senior deputy commissioner at the New York State Education Department in 2009, Dr. King served as a managing director with Uncommon Schools, a non-profit charter management organization that operates some of the highest-performing urban public schools in New York, New Jersey, and Massachusetts. Earlier in his career, Dr. King was a co-founder and co-director for curriculum and instruction of Roxbury (Massachusetts) Preparatory Charter School. Under his leadership, Roxbury Prep became one of the highest-performing urban middle schools in the state, closed the racial achievement gap, and outperformed not only the Boston district schools but also schools in the city's affluent suburbs. Dr. King began his career in education teaching high school social studies in San Juan, Puerto Rico and Boston, Massachusetts. John King reads to students during the Read Where You Are Day of Action. Dr. King earned a Bachelor of Arts in Government from Harvard University, a Master of Arts in the teaching of social studies from Columbia University's Teachers College, a J.D. from Yale Law School, and a Doctor of Education degree in educational administrative practice from Columbia University's Teachers College. Dr. King was a 1995 Truman Scholar and received the James Madison Memorial Fellowship for secondary-level teaching of American history, American government, and social studies. 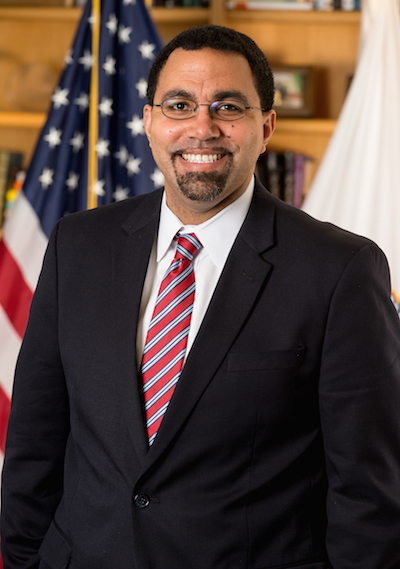 Prior to joining the Department, in February 2011, Dr. King was appointed by U.S. Secretary of Education Arne Duncan to serve on the U.S. Department of Education's Equity and Excellence Commission. In addition, Dr. King served on the board of New Leaders for New Schools from 2005 to 2009, and is a 2008 Aspen Institute-New Schools Entrepreneurial Leaders for Public Education Fellow. Dr. King's life story is an extraordinary testament to the power of education. Both of Dr. King's parents were career New York City public school educators, whose example serves as an enduring inspiration. Dr. King's parents both died from illness by the time he was 12, and he struggled to cope with their loss as he moved between family members and schools. He credits New York City public school teachers — particularly his teachers at P.S. 276 in Canarsie and Mark Twain J.H.S. in Coney Island — for saving his life by providing transformative educational experiences and giving him hope about the future. His belief in the centrality of educational opportunity to the American Dream and the vital necessity of second chances for our young people has its foundations in his own experience of overcoming so many challenges and going on to graduate from Harvard, Yale and Columbia and become a teacher and education leader. For his leadership on issues of educational equity, King has been honored with the Ann S. Kheel Award from the New York Urban League, the Eugene M. Lang Lifetime Achievement Award from the "I Have A Dream" Foundation, the New York Immigration Coalition Builders of the "New" New York Award, and the Robin Hood Foundation Heroes Award. Dr. King lives in Takoma Park, Maryland, with his wife and two children, who attend local public schools.